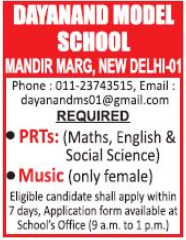 Dayanand Model School, New Delhi has advertised in THE HINDUSTAN TIMES newspaper for the recruitment of PRT vacancies. Interested and eligible job aspirants are requested to apply with in 7 days. Check out further more details below. About School: Dayanand Model School, Mandir Marg is one of the premier public schools under the DAVCMC. The school is unique in the sense that it aims to bring about a balanced and harmonious development of the future citizens of the country and to infuse in them the ideals of vedic culture.Established in 1957 it was the first school in Delhi started by the DAVCMC. Its foundation stone was laid by Honourable Late Shri Meherchandji Mahajan and Mahatma Anand Swami on Mahatma Hansraj ji's birthday. Since then the school has come a long way and has carved a niche for itself with others .Inspite of being situated in a locality with other competing schools,it is holding its own. It is growing from strength to strength. The school has provision for teaching from Nursery to Class VIII. Appreciating the significant strides taken by the school in teaching, the DAVCMC provided an additional school building in Gole Market area in 2004 for the Nursery branch . We are thankful to the DAVCMC for recognising our efforts and giving us the additional responsibility. The school celebrated its Golden Jubilee in 2007.